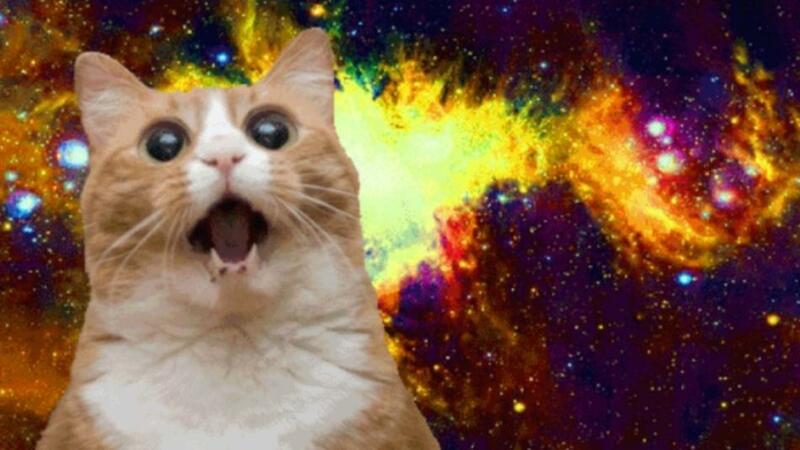 Can science predict the next big meme? Imagine if you could construct an algorithm to predict the next Grumpy Cat, or set up a formula to determine whether a baby animal dressed in couture will fare better as a viral image. Well, we’re not quite there yet, but a new study brings us closer to understanding how research can help predict the next Web craze. 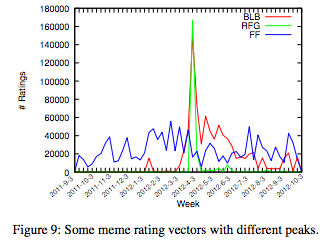 We recently looked at the rise and fall of some famous memes, but new research by Harvard fellow Michele Coscia took the idea of charting memes to a whole new level, using scientific calculations to figure out the factors that go into a successful meme. 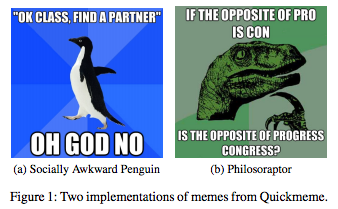 The study uses the meme aggregation site Quickmeme as a reference point, analyzing only memes registered there. Since Quickmeme started as a Reddit side project, many of the popular memes that originated on Reddit are accounted for, like Scumbag Steve and First World Problems, along with Socially Awkward Penguin and Philosoraptor. What is the measure of a meme? This means looking at how memes skyrocket to fame or fester in the bowels of the Internet works better if you look at the other memes getting attention at the same time. So which memes compete and which memes collaborate? It’s hard to tell which complement each other and which hog the spotlight. For instance, in one of the charts provided, Coscia show some of the most collaborative and competitive memes. The only problem in using this info? Both sets of memes are related. The “College Freshman” set of memes is mostly focused on poking fun at people who are less competent than they imagine, with the outlier being “All The Things,” which isn’t as pointed as the others but nevertheless features someone making hyperbolic statements. The competitive memes have around the same amount of thematic coherence, since they mainly focus on calling out gross/lazy/pretentious people. Coscia found that collaboration is more common than competition, probably because you can like lots of memes at the same time without diminishing the popularity of others. Not every meme has the same shelf life. Some have an easily traceable peak – the moment when they’re as popular as they’ll ever be. Some don’t really have a noticeable peak but continue pervading the culture at a lower level for longer. Coscia looked at three memes to illustrate the different trajectories: Bad Luck Brian has a definite peak but a gradual tapering (people still use it), while Ridiculously Photogenic Guy had a brief moment of relevance before fading into obscurity. On the other hand, Futurama Fry never enjoyed the heights of success as Ridiculously Photogenic Guy, but it’s still kicking. Coscia shows us that you don’t want a lot of competition if you’re a flash-in-the-pan type meme, but that you can do well collaboratively if you’re a meme with legs. This is good to know if you’re trying to make a meme based on a current event – it’s got to stand out from the crowd, since people will ruthlessly abandon it if something better comes along. But the study excludes a crucial element for figuring out how to make a dynamite meme. 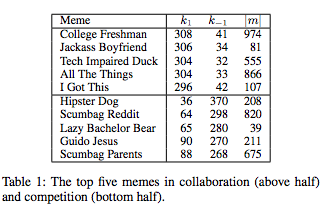 Coscia study was solely focused on memes and their relationships to other memes, and not the mediums by which they were spread – so while the study shows how memes fare in collaboration and competition with each other, it doesn’t show the social tools people use to send them around the Web. To truly understand how to create the next big meme, it’s helpful to know the platforms and relationships between people that expedited their spread. Do we share memes posted by close friends or strangers more often? If you first post something on Reddit, does it have a much better chance of reaching viral heights than if you just tweet it? So unfortunately, we haven’t been able to create a Frankenmeme cobbled together according to scientific formulas – but it’s certainly not for lack of effort. In the meantime, you can use the study to figure out whether your meme will sink or swim amongst similarly-captioned photos.